Artist Kasey Tararuj, One-Eyed Girl, creates some pretty amazing customs. Each custom has her unique style, while the mainstream characters are still recognizable as such. Kasey's latest creation is for the "Turtles in Time" group show at Bottleneck Art Gallery in Brooklyn, New York. "Turtles in Time" is a group show which celebrates 30 years of Turtle Power. 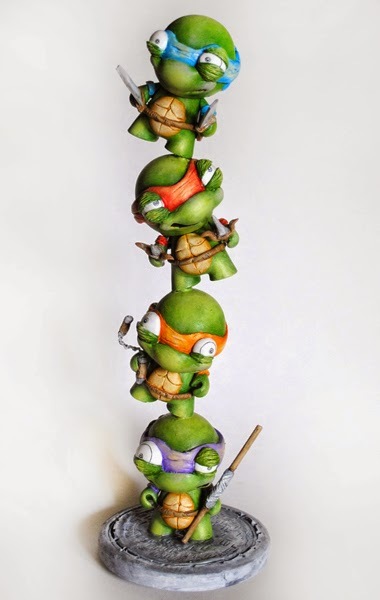 Kasey's custom features all four Turtles in a Leaning Tower of Pizza pose, each turtle carries his respective weapon and has his signature color. Created from 4 micro munnys, with lots of paint and sculpting, this amazing piece will be available during the show opening on October 3rd and online thereafter. Also available, is one of Kasey's customs from the recent Vinyl Thoughts 5 Art show. 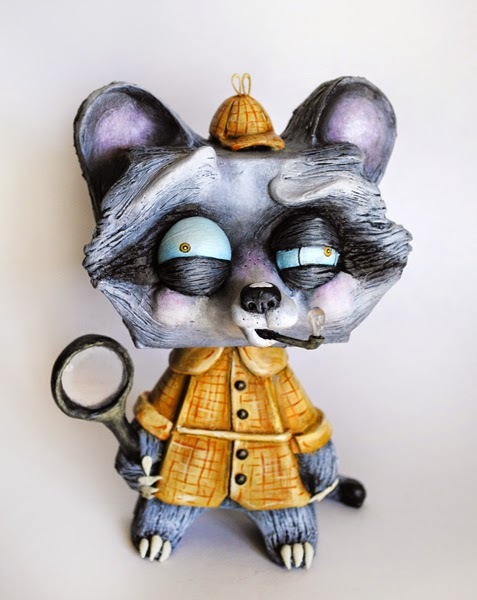 Detective Furlock Ringtail is created from a MADL vinyl figure, featuring Kasey's unique style. 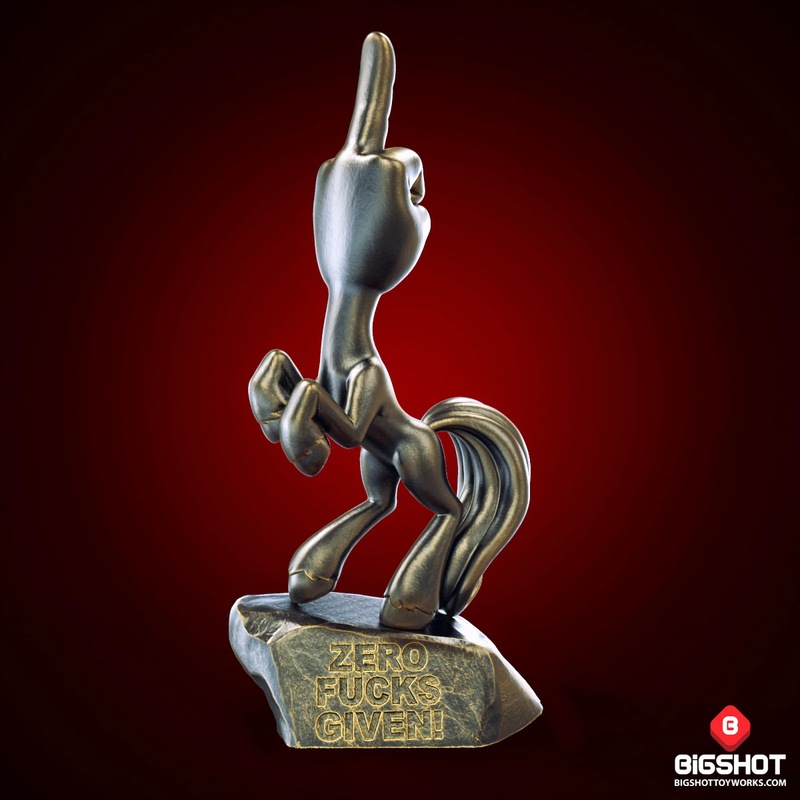 Available now from the Vinyl Thoughts Nation online store for $200, this piece will make a great addition to any collection. Keep up with Kasey's work on her website for One-Eyed Girl. 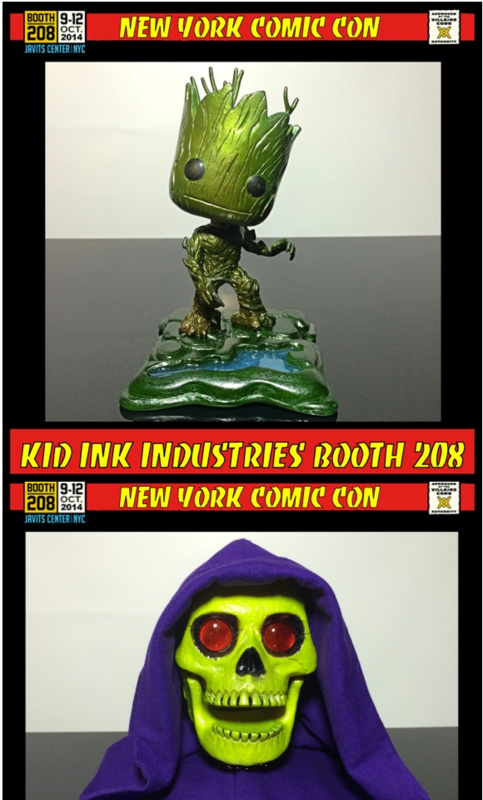 Kris Dulfer has been gearing up for this year's New York Comic Con and teasing us with pics via Instagram and Facebook. Now he's ready to show us the goods. 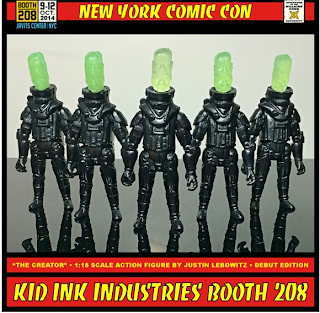 Like last year, Kris will be part of the Tenacious Toys Collective, situated in the middle of The Block at NYCC. He'll have some really unique wares as you can see below. From custom painted sofubi skulls and kaiju like Grody Shogun to an gooey Groot and sparkly Yoda. 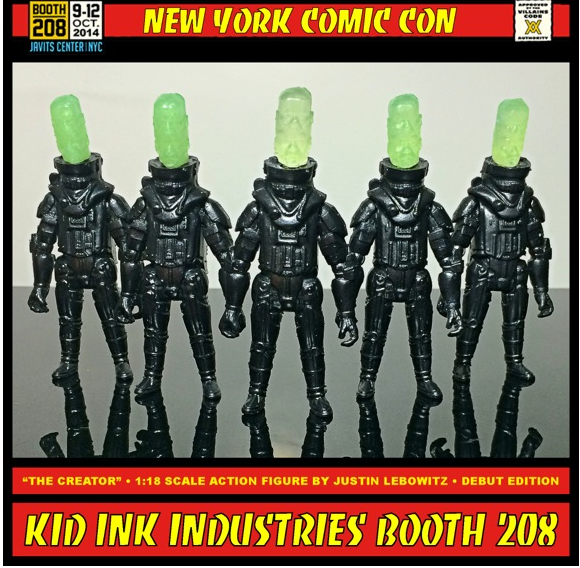 Stop by booth #208 to check out the wares KiD iNK iNDUSTRiES has to offer, including a debut action figure by Justin Lebowitz! Hooray, it's ZeroFucksFriday and the FUnicorn is almost here! Bigshot Toyworks proudly presents... the FUnicorn!! Riding to your aid like a majestical steed, dealing backhands of justice, with zero fucks given or taken. In a world of pretty ponies and other glitter-spewing magical creatures, the FUnicorn gallops across the land with his head held high, ready to spread his message… of love. More info soon! 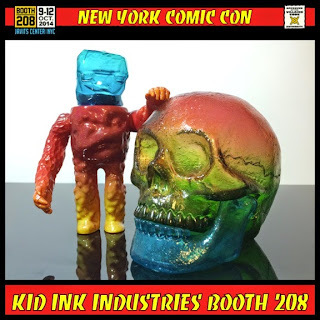 Artist Carson Catlin brings his fantastic reticulated style to New York Comic Con this year and Suburban Vinyl will be showcasing his work. Using some of the latest platforms Catlin has created some amazing pieces for Suburban Vinyl. 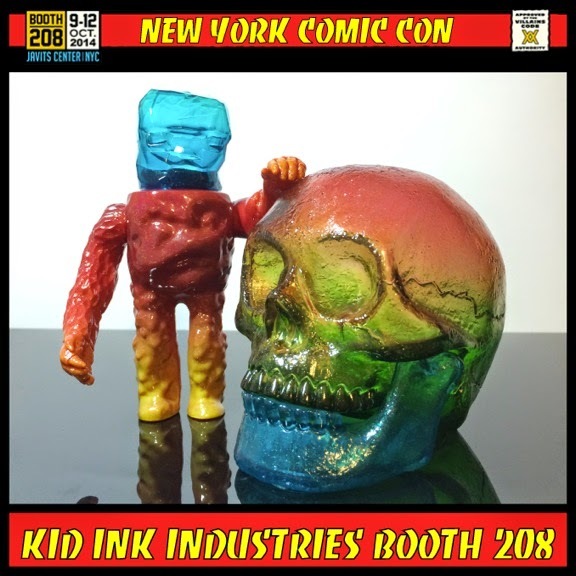 They will have an assortment of 7 4" Munnys, 2 Coarse mini omens, 2 Kronk Mayhem Dunnys and a Dead Zebra Last Knight. 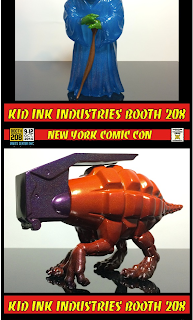 Make sure to go and visit them at booth 208 to take a look at these amazing pieces and pick one up for yourself. 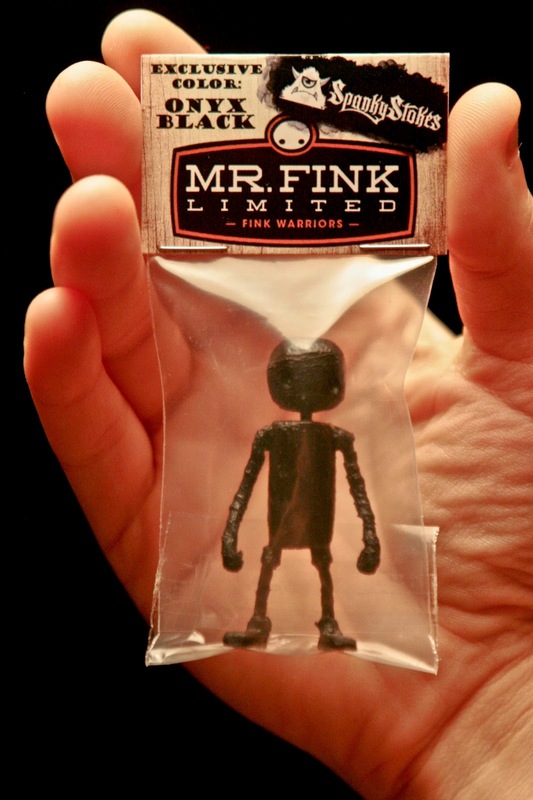 Introducing the new 2.25" resin Fink Warriors by Mr. Fink! DIYs and custom figures dropping this Saturday at 10.30pm UK time... more exclusives and colorways will be available via PlayDeadToys, Tenacious Toys and Spanky Stokes at later dates. 25 Fink Warriors will go up on the Fink website on 4/10/14 (Saturday). There will be 20 x DIY bagged (above) and 5 x hand painted, kitted up and boxed (below). They will be available from http://www.mrfinklimited.com and a further 20 of each exclusive colorway will also be available from the retailers listed below. 4 'Chase' figures will be randomly available through these retailers, each customized by Michael 'Bubo' Reilly. More info will be posted here on this blog as the next colorways roll out! 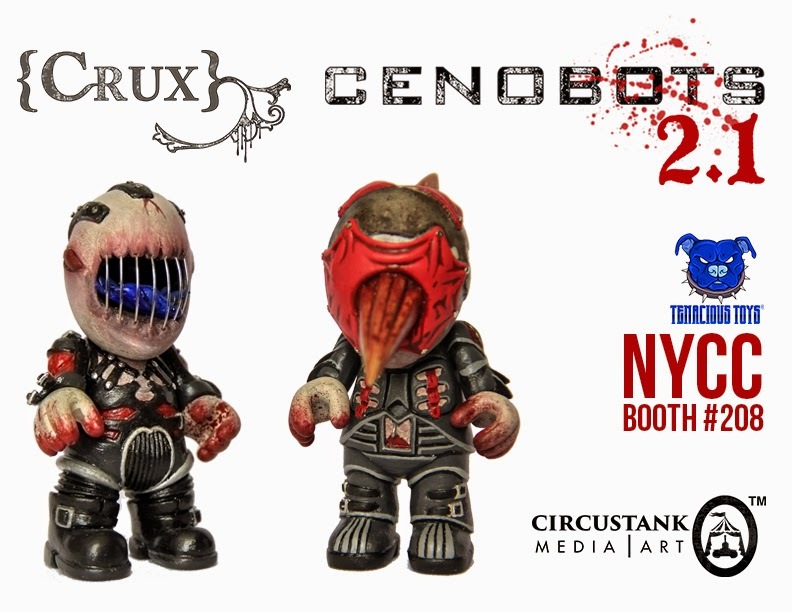 At our NYCC booth #208 we will be releasing a new edition of the Cenobots blind-box custom series. With over a dozen talented artists and 25+ pieces in this series, there is a lot to get excited about for Hellraiser fans! Pictured above are the entries by Crux Delgado, who also served as the graphic designer for the artwork for this series. You will see his artwork on the blind boxes. 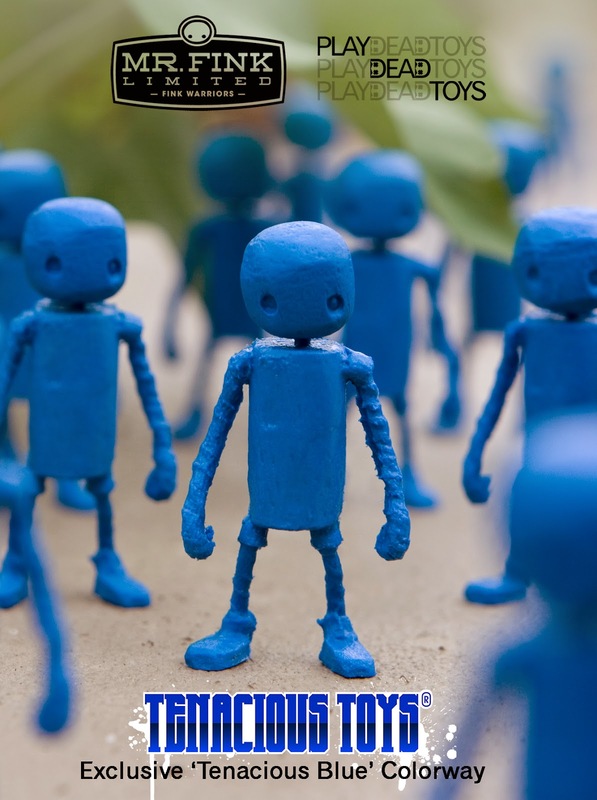 The Cenobots 2.1 blind box figures will be $75 each and we will have a few on display out of box to swap after each sale. Buy, swap, love them! Come to Booth 208 to find them. 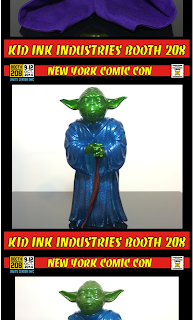 With less than a week to go before NYCC Geek Stuff still has a few more booth exclusives to announce. 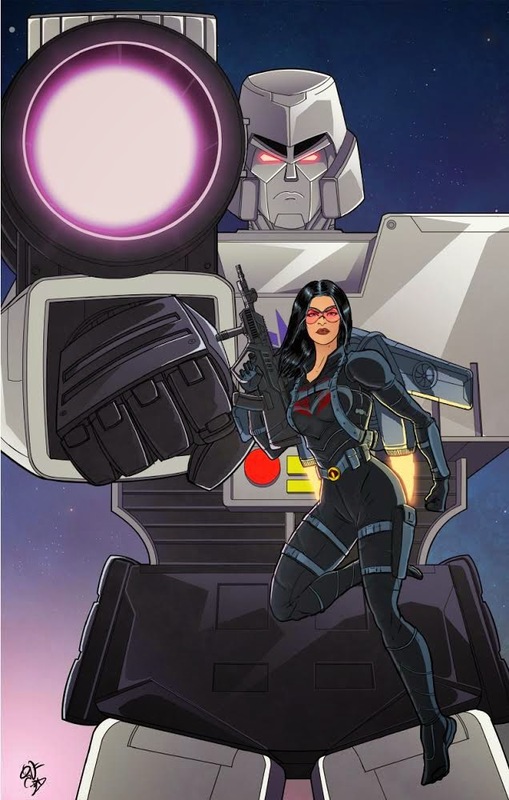 This time it's the awesome GI Joe/ Transformers prints from artist George Vega and colorist Brandi Dixon. These limited edition prints are 11x17 and will sell for $20 a piece and will be available exclusively at the Geek Stuff booth #127 throughout the con's four day run. Can you stand on your head? Maybe not quite like Cheshire Cat can. Inspired by one of my favourite creepy characters, I made some slight modifications for this 7" Trikky to do the job a little more elegantly; shortened neck peg with embedded magnets, and fabric bottoms on the feet. "Can You Stand On Your Head" is part of Kidrobot San Francisco's Hello Trikky Exhibition, opening this Friday October 3. He's a little cute, a little creepy, and a little of what nightmares are made of. The Mome Raths join the party from out of Chesh's ears, and around back, his teeth become ace of hearts playing cards. If you're in the San Francisco area for October 3rd, swing through the opening at Kidrobot San Francisco's storefront location. Adam Quesnell is a comedian on Stand Up! Records and also happens to be an avid toy collector. Being an avid toy collector, Adam couldn't just release an album and call it day. Instead, Adam and Stand Up! Records teamed up with illustrator Terence Brown II, October Toys and Tru:Tek to create a 3" rubber toy called "DESPAIR". 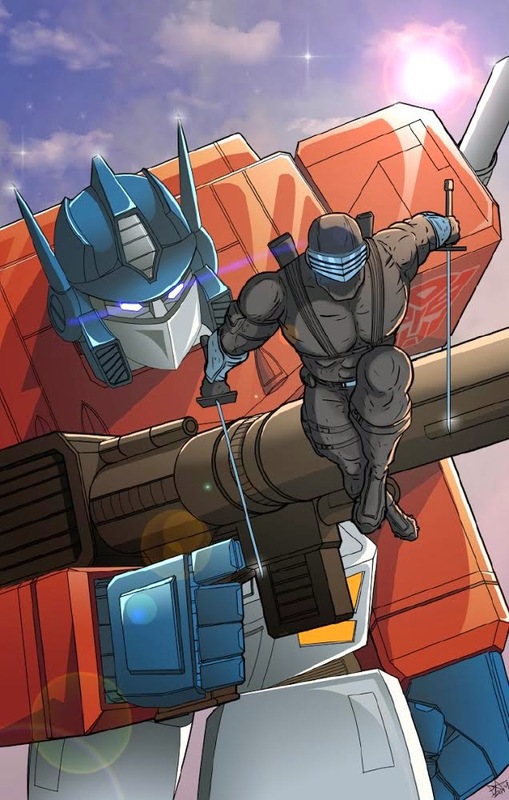 Despair is a demon from the 10th Circle of Hell; the level where people who make bad cinematic adaptations of classic toy properties are flayed for eternity. Not your average demon, Despair suffers from severe anxiety disorder and crippling depression. Satan himself banished Despair from Hell for being a major bummer. Cast out upon the earth in a fiery geyser of lava and tears, Despair landed in the parking lot of a comedy club that was hosting a weekly open mic night. Despair put his name on the sign-up sheet, got on stage, and told his story. Since then, he has been punishing himself, night after night, on comedy stages of varying quality throughout the Midwest. He dances and lashes himself for audiences with hopes of selling t-shirts and CDs to drunk people who will not wear or listen to them. Despair will release on Halloween 2014 and will coincide with the release of Adam's album "Can We Afford This Much Despair?". The initial Despair figure release will be the flesh colored rubber, with more colorways to follow(check out Adam's website for a sneak peak). Each figure will come with a code to digitally download Adam's album. Stay tuned for more info, as pricing and availability has yet to be released. Have you talked to a Demon or danced with the Devil? Well if you have, then chances are you've met the Underworld's bouncer also know at The Gatekeeper. With multiple paint applications and packaged on a laser engraved backer board that resembles a Ouija Board, this is like nothing you've ever seen before. 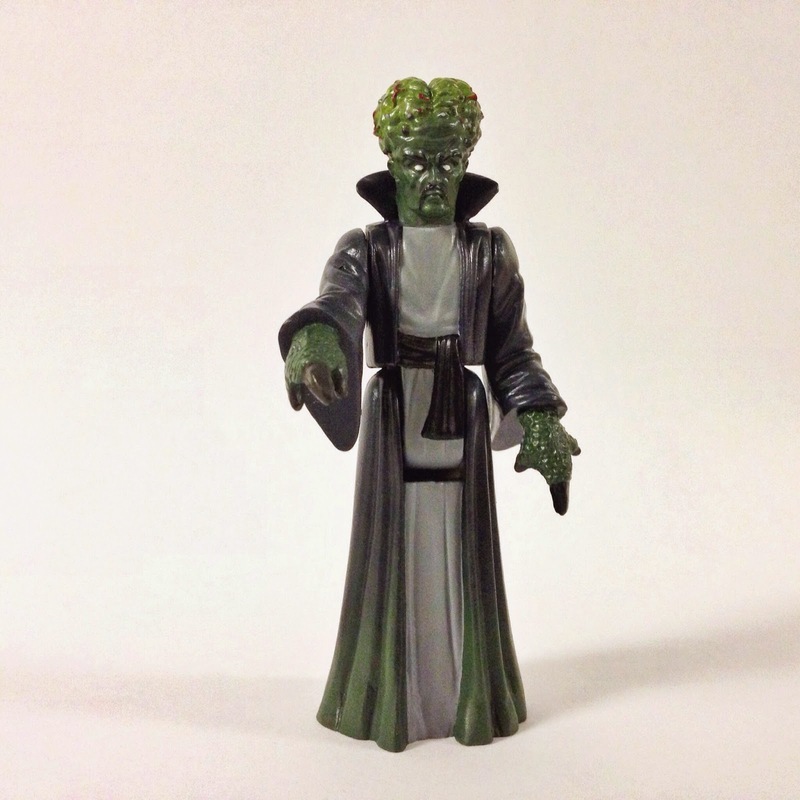 With a small run of only 15 available, this figure will vanish faster than a ghost. 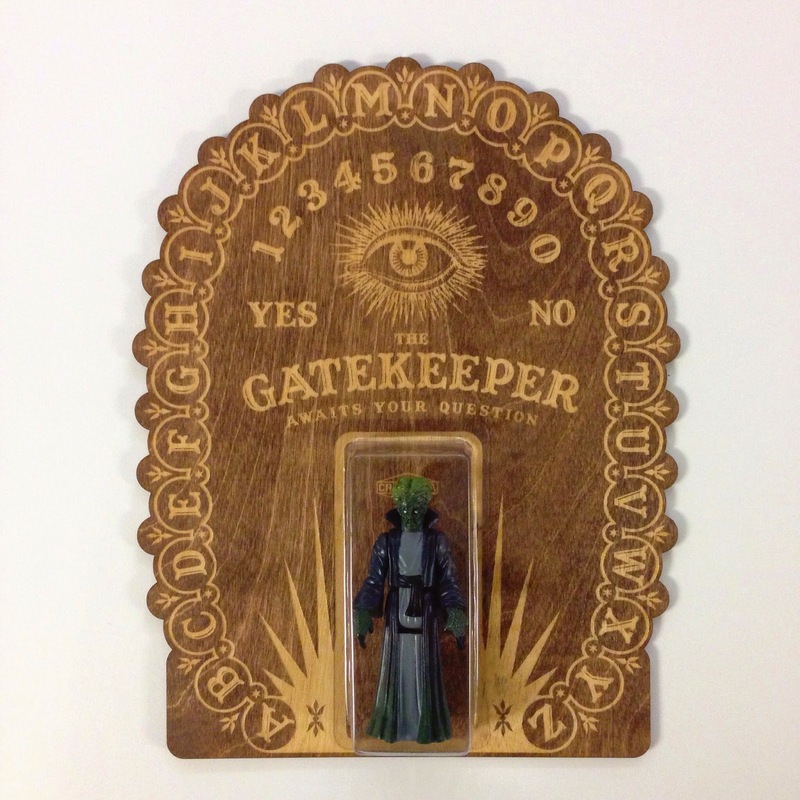 PRE-ORDER the Gatekeeper for $75 each on October 1st at 8PM, MST only at CredendaStudios.net. So act fast! The Gatekeeper awaits your question. The only thing is, can you handle the answer?